Meet Dash, a fun, real robot who is charged and ready to play the second it gets into your home. Dash loves to speed through the house, blink its lights and squeal its wheels. The Wonder Workshop Dash robot is a great companion for those kids (for children 8 and up) who want to immerse themselves in the world of programming tools. Dash is a real robot, responsive to the world, on the go and at the ready. Kids imagine the sidekick, pet, or pal they’ve always wanted and bring it to life with Dash and their own code. 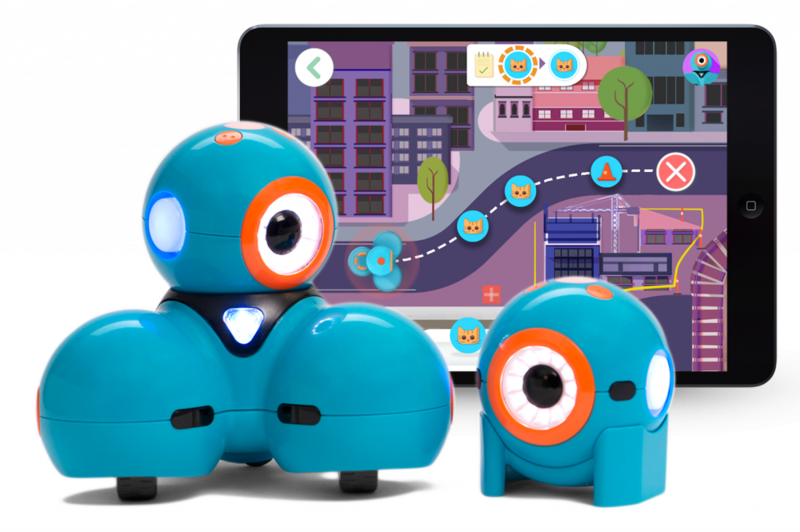 Packed with sensors and capabilities, kids can program Dash to move, dance, light up, make sounds, avoid obstacles, and even react to their voice. Dash is a faithful explorer in the world your child creates. Dash can greet kids as they come home from school, help them deliver a message to a friend, follows them on journeys, become a true partner in fun. There are no limits to what your child can do with Dash. As a real robot, Dash has sensors that let it know when it’s about to run into something in front or in back of it, microphones that can hear sound and even detect where it’s coming from in a room, infrared sensors that let it see and communicate with other robots, like Dot. You can even record sounds on your tablet or phone and have Dash play them back to surprise friends and family! Unlike some robotics products that need hours of assembly, Dot comes pre-assembled and ready to play – there’s no assembly required! Once you install Blockly and Wonder on your iOS or Android smartphone or tablet, you child will have fun challenge tutorials that will teach them programming — while they’re having fun making Dash do lots of funny things! With over 600 built-in tutorials, challenges, and projects, your child can explore programming at their own pace – no expensive robot camps needed! Dash works with all of our free apps for iOS or Android, with apps like Go and Path for all ages; for children 8 and up we have our Wonder and Blockly apps, which they can use to program Dash all on their own – we include in-app challenge tutorials that let children explore at their own pace to give them the confidence and self-reliance to learn coding on their own, all while having fun controlling their own robot. Wonder Workshop apps work on smartphones and tablets that support Bluetooth LE (Bluetooth 2.0). A Dash of Wonder Workshop for all iOS is free and available on Android-using. The Path of Go and appropriate for all ages. The Blockly and entertainment applications Wonder holds educational programs for children over 8 years of age, can learn about the program through which the mysteries while instructions are given on the dash. The children learn about their own pace with over 600 built-in tutorials, puzzles and projects through the world of programming. They can gain sufficient confidence to independently learn to program. The final app is called Blockly and it’s marked as being for ages eight and up. We decided to give it a go anyway and I’m glad we did; this is where Dash soars above the other toys. Blockly offers a simple interface where you can drag and drop different blocks from six categories on the left hand side. It lets you slot together chains of events: When the top button on Dash’s head is pressed, make him say hi, change your lights to a specific color, look left or right, move forward a certain distance, and so on. You can also use voices and claps to trigger things, or tell Dash how to react when it comes into contact with an obstacle. You can even add a time element, or tell Dash to repeat something until another trigger event, such as a voice, obstacle, or button press is encountered.